Every year I swear I’m reformed enough to get my holiday shopping done before December first. And like clockwork, I show up late to Christmas Eve dinner at my grandma’s house because I was shopping for gifts. I should mention, it’s not just presents I procrastinate; I do the same thing with sending holiday cards…which have been known to morph into Happy New Year! cards, or worse, disappear altogether. I tried to add a layer of accountability by telling Gina after lunch last Friday that I would finish writing my holiday cards that night. I went so far as to splay them out on the table Friday night, beside a felt tip pen. 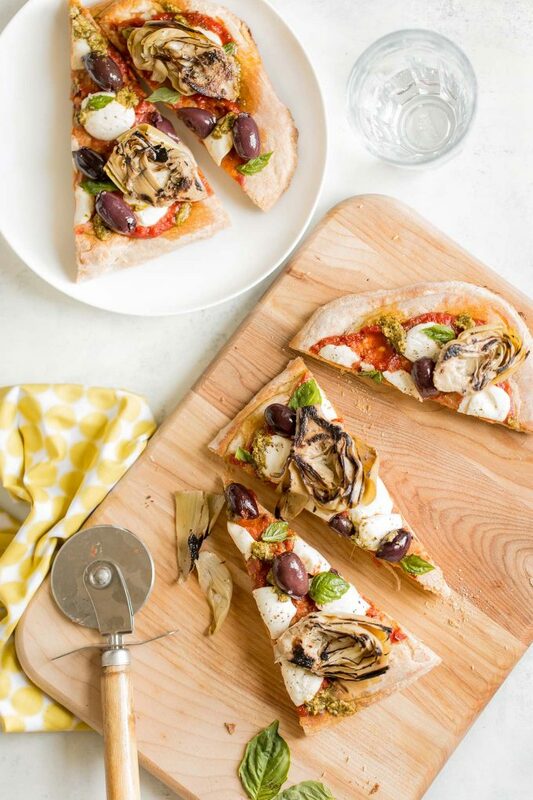 And then I took a good look at them, left the room, and made a grilled artichoke, olive, and pesto flatbread recipe instead. Look, I never would have enjoyed the cards this much. 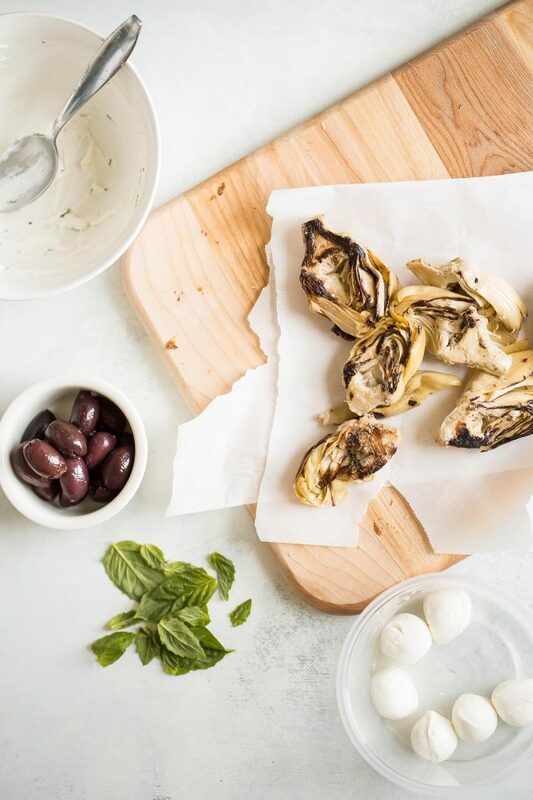 Then I start layering those Mediterranean flavors of grilled artichoke, olive, and pesto. But first, a smear of sweet DeLallo Margherita-Style Pizza Sauce, followed by fresh mozzarella (I like using ciliegine, which are small, cherry-sized balls of fresh mozzarella, which I cut in half before arranging over the flatbreads. If you use a large ball of fresh mozzarella, just thinly slice it!). Next up: my favorite: DeLallo Pitted and Seasoned Calamata Olives, DeLallo Grilled Artichokes, and finally a few thin slices of red onion. Once baked to perfection, I drizzle (a very imprecise process) DeLallo Traditional Basil Pesto over the flatbreads, garnish with fresh basil, slice into wedges, and serve! Here’s exactly how it’s made! Open the DeLallo Pizza Dough Kit and in a large bowl, combine the flour mix and yeast packet with the 1 ¼ cups warm water. Stir with a fork until a dough begins to form. Preheat the oven to 450˚F. Divide the dough into 2 equal pieces. Lightly oil a large baking pan. Form the dough into 2 thin rectangles on the baking pan. (*Note that you could also make one larger thick crust pizza). Spread ⅓ cup pizza sauce on each of the rectangles, then divide the mozzarella among the dough rectangles (*if using a ball of mozzarella, slice it thinly. If using small mozzarella balls, halve them.) 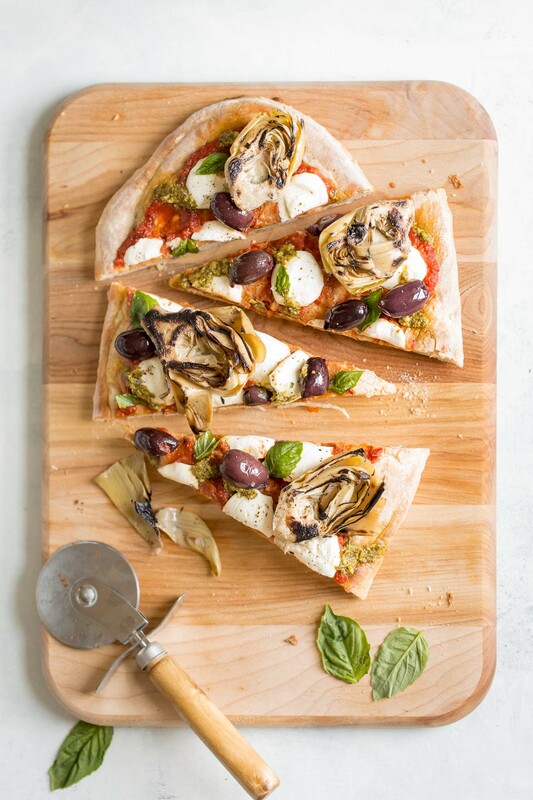 Divide the olives, onions, and artichokes among the pizzas. Bake until the crusts are golden and crispy. Drizzle the pesto over the flatbreads (it will be messy and imprecise) and top each with fresh basil leaves. Cut into wedges and serve.